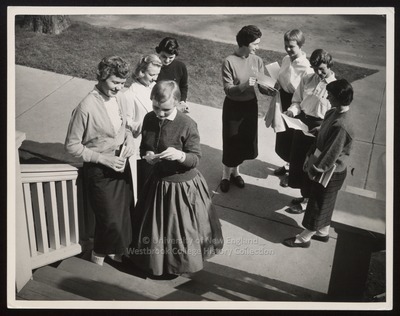 Eight Westbrook Junior College students, posed on campus steps, share their mail in this 1959 black and white photograph by William M. Rittase, Philadelphia, PA. The young women stand in two groups of four with Betty Bailey, centered and featured, for possible inclusion within the late 1950s, early 1960s admission brochure. All wear skirts and sweaters or skirts and white blouses, and loafers and white bobby sox.